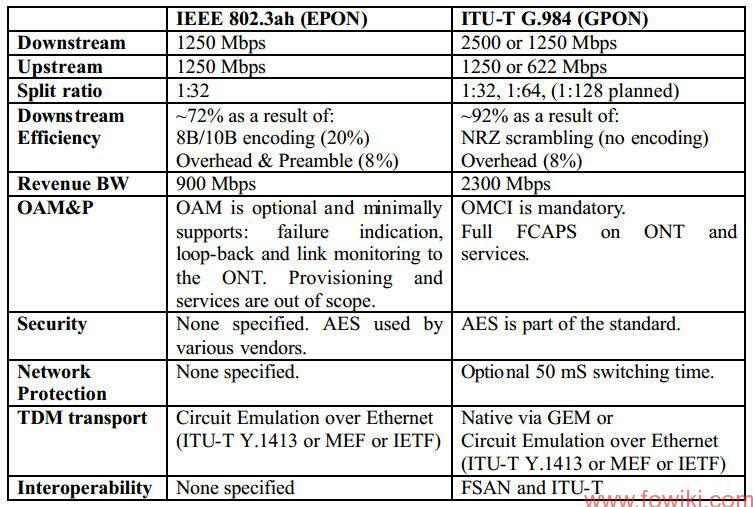 Refer to the above table, GPON seemed is more competitive than EPON technology. GPON support more flexible OAM, with better interoperability and security. which is necessary for big telecom operators, however, the cost for GPON OLT and ONT is relative higher than EPON equipment. Thus the more comparison should considered for choosing GPON or EPON network. Given these assumptions, Figures 1 illustrates the total network equipment cost differences while Figure 2 provides the cost per subscriber. 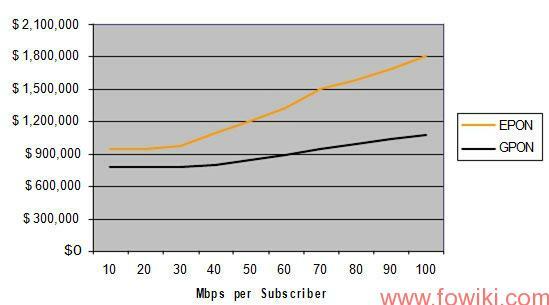 GPON’s significant cost advantage is simply a result of the reduction in the number of OLT’s needed. 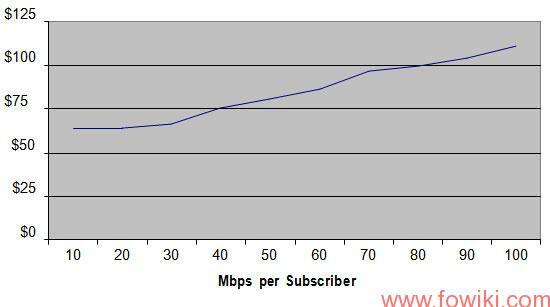 This is because of GPON’s higher downstream bandwidth and bandwidth efficiency, as well as split ratio. 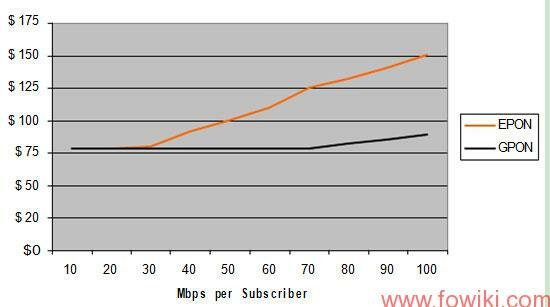 As seen in Table 1 and Figure 1, at 100 Mbps per subscriber, GPON offers up to a 2.6:1 OLT advantage for this network which means a total savings of about $0.9M. Given this OLT cost savings, the cost sensitivity of a GPON ONT can be calculated based on the money saved and then applied against the total number of ONTs in the network. Thus, for a GPON OLT savings of $1.2M for 100 Mbps subscriber service, $1.2M can be spent on 10,000 ONTs to obtain an equivalent EPON cost. Thus the GPON ONTs can cost $220 or 120% more than an EPON ONT in order to have the same total network costs. 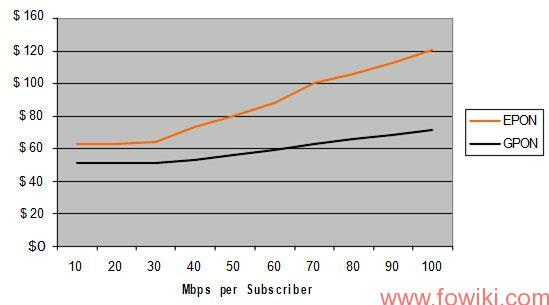 A major factor for GPON’s cost performance is its split ratio. 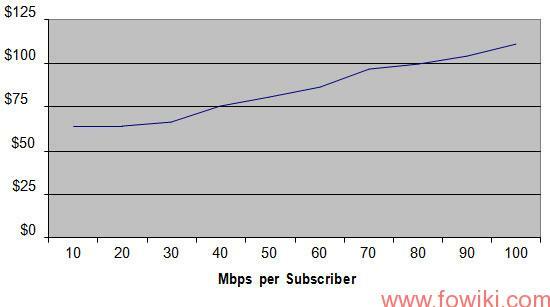 Thus, cost per subscriber impact in reducing the GPON split ratio to 1:32 needs to be determined. The result is illustrated in Figure 5. This simple cost analysis for a given FTTP network highlight’s GPON’s significant cost advantage over EPON. This is due to GPON’s higher split ratio, line rate and bandwidth efficiency which results in a reduction in the amount of OLT equipment by more than a factor of 2 over EPON. This also translates into significant space and power reduction at the Central Office as illustrated in Table 2 as well as life cycle cost savings due to the reduction in OLT equipment. As with ITU-T G.983 BPON, GPON also promises equipment interoperability through Full Service Access Network (FSAN) and ITU initiatives. This enables ubiquitous deployment of PON whereby various vendor’s OLTs and ONTs can be mixed and matched across a network as is done with BPON. It also enables the supply of low-cost, high volume PON ONTs from CPE vendors as is done in the DSL industry, thus further enabling low-cost PON deployment. The currently acceptable price of EPON from vendors has enabled service providers to deploy residential PONs in mass in Asia. The ITU-T G.984 GPON standard provides native carrier class transport of both Ethernet and legacy TDM and thus has the promise of a single cost-effective PON technology for both residential and business service. As consumer bandwidth increases from 10 Mbps for best-effort high-speed internet data up to sustained 100 Mbps for multiple IPTV streams of SDTV and HDTV, GPON offers the best cost advantage over EPON. For more information about GPON & EPON, please add skype: sales.tarluz, or email to jerry##tarluz.com (change ## to @).